Are you excited about planning your next trip? Do you want to try something new? Would you like some guidance from a local? If you answered yes to any of these questions, then this Greater Than a Tourist audiobook is for you. 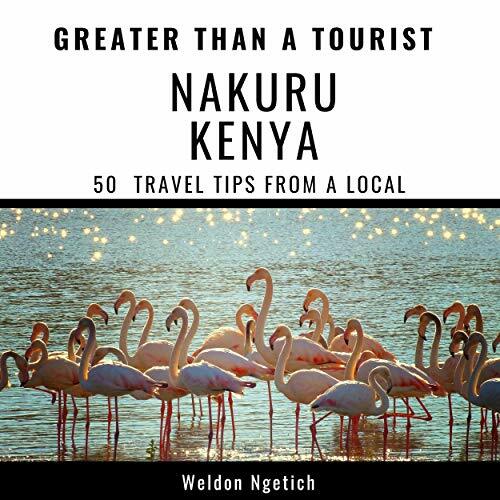 Greater Than a Tourist: Nakuru, Kenya by Weldon Ngetich is a handy tool belt for any traveler. It provides listeners with important details of Nakuru, Kenya, a tourist destination from a local’s perspective, and it awakens their senses to the wildness of Africa safari that awaits them. Most travel audiobooks tell you how to travel like a tourist. Although there is nothing wrong with that, as part of the Greater Than a Tourist series, this audiobook will give you travel tips from someone who has lived at your next travel destination. You will discover advice that will help you throughout your stay. This audiobook will not tell you exact addresses or store hours but instead will give you excitement and knowledge from a local that you may not find in other smaller travel audiobooks. Travel like a local. Slow down, stay in one place, and get to know the people and the culture. By the time you finish this audiobook, you will be eager and prepared to travel to your next destination.